The annual gathering of Benetti Yacht Captains for an update on legislative, tax operational and good practices... and a bit of fun. Valletta Superyachts is proud to Nice again for the third time running sponsor the prestigious event and contribute as a panelist with updates on Charter Tax / VAT Guidelines. Valletta Superyachts, as the authorized Benetti Service Partner in Malta and a professional superyacht agency and concierge, will join a family of prestigious international brands to support the 16th Azimut|Benetti Yachtmaster to be held in Tuscany, Italy between the 3rd and 6th February 2016. Hailed as an iconic event in the global superyacht industry, the Azimut |Benetti Yachtmaster is the much awaited annual gathering organised by Azimut|Benetti Group for its fleet captains and Owners' representatives. Each year this event brings together marine specialists for dynamic, interactive management training which provides a perfect balance between professional training and entertainment. Interactive full-day sessions with round table discussions, workshops, thematic meetings and networking opportunities, the Azimut|Benetti Yachtmaster is led by professional and experienced moderators, who deal and focus on the most important and pressing issues and Valletta Superyachts is proud to be one of the keynote speakers and panelists of this event. A panel of International Partners provide fundamental contributions to the delegates wherein latest innovations in their segment are presented to the marine sector’s leading players. Valletta Superyachts shall be contributing with the presence of Niki Travers Tauss, Dr. Christian Farrugia and Ing. Paul Cardona who will participate on the various panels of the event. “We are proud to be sponsoring the Azimut|Benetti Yachtmaster event since this ties in with our efforts in contributing to Malta’s efforts in becoming a centre of excellence for superyachts”, said Niki Travers Tauss, Valletta Superyachts CEO, “Our support, participation and involvement in such an important event are consistent with our efforts towards making Malta a superyacht destination”. Established fifteen years ago in Italy, this event has grown from one localised event to a major world event hosted in the United States and Asia. Show's underway and bustling with activity. We thought we'd share the view off the bow of Benetti's 140 Veloce on show. What a great event, set in the most lush and recluse bay on the Italian Riviera. The full range of yachts on offer from the group on display and seatrial for a privileged number of people who were lucky enough to attend. The event came to a close with a fantastic evening beach party at picturesque Paraggi beach club. Valletta Superyachts has been named Exclusive Superyacht Concierge Partner to forthcoming RC44 Valletta Cup which will be kicking off the 2015 RC44 Championship Tour and making its debut on to the RC44 circuit in Malta’s renowned capital Valletta. Held between the 25th and 29th March, the RC44 Valletta Cup will take place in one of the world’s largest and deepest natural harbours. Valletta, a historic city on the East coast of Malta will offer the sailors a thrilling start to the season, racing against the backdrop of the city’s magnificent fortress. The crew line up for the RC44 Valletta Cup reads like a who's who of sailing greats, bringing Olympic medallists and America’s Cup veterans and top international businessmen together to guarantee highly competitive racing right in the heart of the Mediterranean. This partnership was recently announced by Valletta Superyachts’ CEO and Founder Niki Travers Tauss who expressed his excitement at being part of this prestigious venture, a debut for Malta. “The prestige that the RC44 brings to the island of Malta fits in nicely with what Valletta Superyachts offers to the ever growing super yacht industry in Malta. The Valletta Grand Harbour is quickly becoming the port of choice for many super yachts and we are here to provide them with the right expertise to make their experience one that will encourage them to keep returning to our island’. said Travers Tauss. The Valletta Superyachts team is small yet agile allowing it to respond to clients’ needs, immediately. The Valletta Superyachts Concierge offers captains and crew of visiting Superyachts peace-of-mind and hassle-free delivery of day-to-day requirements including Berthing, Bunkering, Provisioning, Hospitality Services and Guest Transfer Requirements. On the quay, a highly qualified and trained technical team is able to offer service and support. 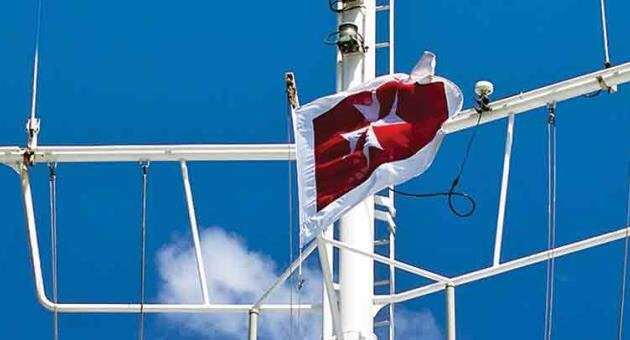 As at end of December 2014, the registered gross tonnage under the Merchant Shipping Act was 57.9 million gross tons with over 2,500 merchant vessels fly the Maltese Flag. By end of 2014, the authority had processed over 191,376 applications from officers serving or wanting to serve on Maltese ships, for the issue of endorsements attesting to the recognition of their certificate of competency issued by a foreign administration. Of these, 16,639 were processed in the year under review.These statistics represent record figures for the Malta Flag and a significant achievement for the Malta Flag Administration. Minister for Transport and Infrastructure, Joe Mizzi, commented "this status was achieved thanks to the efforts of all stakeholders including shipowners, seafarers, the efforts of the personnel of Transport Malta, particularly those at the Merchant Shipping Directorate and a joint effort by the Authority and the Maltese Shipping community to attract serious companies to the Maltese Register. The fact that the Malta Flag Administration has managed to concurrently increase both its growth rate and enhance the technical performance of its registered fleet further confirms the Authority's adopted strategy to focus on quality. Year on year record growth figures further consolidate the Island's register as the flag of choice of the major International ship-owning companies and re-affirms Malta's reputation as a leading maritime nation. I take this opportunity to thank all stakeholders for their contribution and confidence shown in the Malta flag." Today, the Malta Register has also become a world leader in commercial yachts registration where Malta has also registered positive results. Despite the current financial situation worlwide, the Malta flag registered an increase of 13.6% over the previous year, in the registration of superyachts of over 24 metres in length. As of the end of December 2014, the superyacht fleet flying the conspicuous Maltese cross worldwide was 452. Mr Piscopo concluded: "these positive results encourage us to work harder to ensure that Maritime Malta continues to benefit from the associated positioning within these international sectors, both from the substantial direct foreign revenue and value added in the economy. These results also represent yet another milestone towards further consolidating Malta as an international centre of maritime excellence in the Mediterranean."